Black nylon upholstery is comfortable, lightweight and easy to clean. It serves the purpose for which I bought it.... getting mom from building to car, into appointments, and out for a brief walk. She ambulates with a walker so this just fills the gap for when I'd like to move a bit more quickly and easily. Pros:The weight is manageable- I can lift it in and out of my vehicle. Super easy to open and close! Although I don't love that the footrests are not permanently attached, at least they are easy to add and take off. Cons:Two minor issues: You have to keep track of the footrests, and handle them separately. I'm looking for a bag to keep them in to improve efficiency with that task. Also, I couldn't use it immediately, as the chemical smells from the manufacturing process/new materials were very strong. It needed to 'air out' for at least a week. All resolved now. Not happy, out cost without recourse. Cons:seat too narrow, foot rests cause knees to be too tightly bent, not enough room to lengthen them. Most unhappy about being stuck with a chair that doesn't work for me. Company won't take it back or provide a refund. Won't use them again nor recommend them. Drive chair finally got a yes from my high maintenance mother. She stopped driving me crazy. 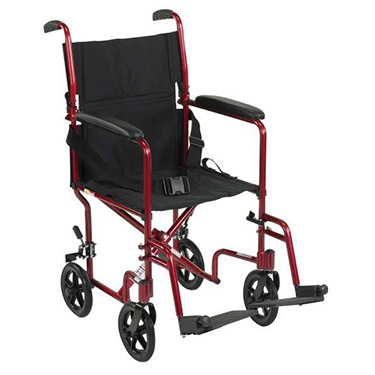 Pros:Lightweight, collapsible, fits in truck with the rollator and cane so we have options on the go. Cons:Wish I could adjust the handles to be a little higher. I'm very tall. Still okay as is though. This super lightweight wheelchair has made it so much easier to get my daughter to and from Doctor appointments with ease. Cons:The back is a bit uncomfortable and my daughter (12yrs old) says she feels like it's pushing her forward.